Published Jan 2, 2014 by Addison-Wesley Professional. Part of the LiveLessons series. Lesson 1: Introduction to InelliJ IDEA gives you a brief introduction to the Oracle Java JDK as well as a step-by-step guide to downloading and installing IntelliJ IDEA Community Edition. Lesson 2: The Basics of IntelliJ teaches what various tool windows, preferences, and menu options are available in the IntelliJ IDEA program. Lesson 3: Working with Projects gives a walkthrough of creating a new project along with adding a module to the project. It also covers many useful keyboard shortcuts to help you get the most out developing with IntelliJ IDEA. Lesson 4: Working with a Version Control System covers installing GitHub for Windows, installing a Git plugin for IntelliJ IDEA, and sharing a project on GitHub. It also shows how to pull a project from GitHub into IntelliJ IDEA. Lesson 5: Creating an Android Project using IntelliJ IDEA starts by downloading, installing, and updating the Android SDK. It then moves directly into starting an Android Project as well as an emulator to test your project on. It finishes with a brief overview of using LogCat within IntelliJ IDEA to view messages inside of your application. Lesson 6: Installing Android Studio covers the system requirements of Android Studio as well as downloading and installing it in a Windows environment. A brief overview of the differences between IntelliJ IDEA Community Edition and Android Studio are also shown. Lesson 7: Starting a new project in Android Studio teaches how to create a new project using the built-in project wizard as well as the new project structure that accomodates the Gradle build system. Lesson 8: Importing an Eclipse project into Android Studio shows how an existing Android project can be exported from Eclipse and imported into Android Studio for further work. Lesson 9: Packaging an Android application in Android Studio gives an introductino to certificates and how they are used with Android applications. It then teaches how to create your own in Android Studio as well as sign and export an APK file. Lesson 10: Introduction to Eclipse shows how versitile the Eclipse platform is by showing some of the popular applications that are based on the Eclipse platform. The various builds of Eclipse are also shown and the Standard 4.3 Kepler build is downloaded, unpacked, and run to confirm installation. Lesson 11: The Basics of Eclipse covers the windows that are available when first opening eclipse in the Java Perspective as well as how to move them, add new views and perspectives. Lesson 12: Working with Projects teaches how Projects are created in Eclipse as well as how they are managed. Essential keyboard shortcuts are also taught to help you get the most out of editing with Eclipse. Lesson 13: Working with a Code Repository shows how Team Synchronization in Eclipse can be set up to use Git and/or SVN. A Connection to each is shown as well as installing the Subclipse plugin. Lesson 14: Instaling the Android plugin in Eclipse 4.3 shows how the ADT Plugin is added to Eclipse using the Install New Software wizard. It also covers the changes that occur with Eclipse when the plugin is added including launching the SDK Manager and the AVD Manager. 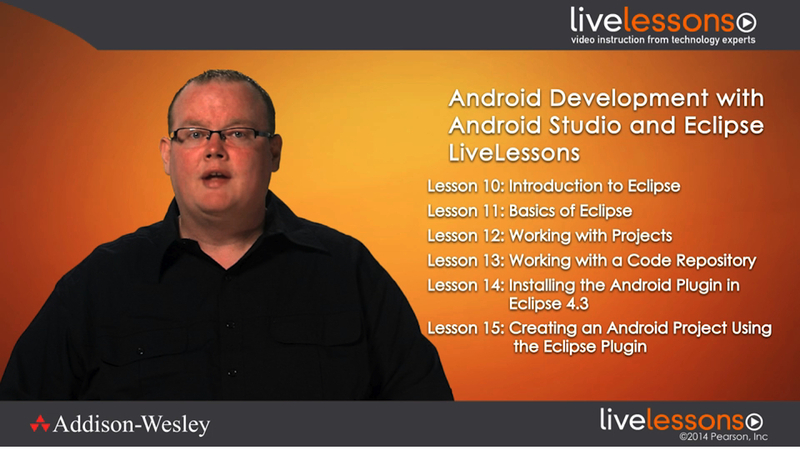 Lesson 15: Creating an Android project using the Eclipse Plugin demonstrates how a new Android project is created and run on an emulator. It also shows the difference in launching with an actual Android device. Lesson 17: Using the ADT Bundle covers the difference between the ADT Bundle and Eclipse 4.3 as well as how to import an Android project from Eclipse 4.3 into the ADT Bundle. The lesson finishes with certificate creation and export of an Android application.